It is custom designed to fit Jeep Wrangler JK JKU Rubicon Sahara X sport & Unlimited 2007 2008 2009 2010 2011 2012 2013 2014 2015 2016 2017 2 & 4 DOOR MODELS. It is crafted from high quality ABS plastic and will not rust, corrode or peel. Protect your cowl from mirror damage with cowl body armor. Whenever your door limiter straps are disconnected the door can over extend causing damage to your cowl area. These new cowl covers protect your cowl area while providing a great look. Constructed of durable UV thermoplastic, these covers easily attach using 3M double sided automotive grade adhesive Simply Attach and Play Sold in pairs. These Body Armor Cowl Guards Made of high quality ABS material and completed in a textured finish for aggressive good looks. Will not rust, corrosion, or spin off, and UV radiation. No messy glue or drilling is required for installation. These Cowl Armors are designed to install simply with the supplied 3M doubled sided automotive bonding tape for a quick and secure installation. Thoroughly clean the surface and then simply peel the 3M tape from the back of the Guards and set them firmly in place. These Cowl Guards not only protect your Jeeps paint from harm, but are an excellent way to cover up and hide existing scuffs and scratches. very durable and can improve the safety of the car. A set of 2Pcs of Cowl Body Armor . 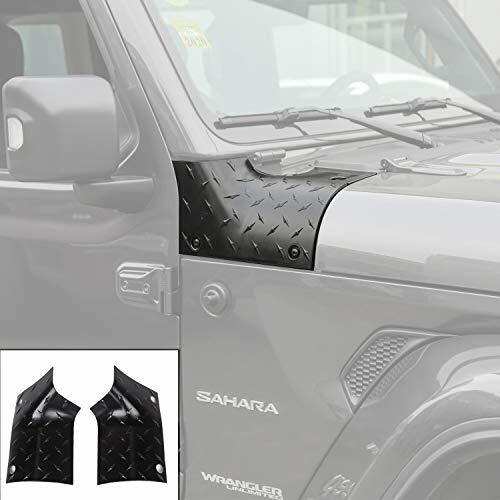 Protect your Jeep from the hazards of brush,tones and other trail debris when Driving your Cool Jeep Wrangler on Rugged Road with a set of JeCar Jeep Armor.The Jeep Cowl Cover are Excellent Jeep Accessories to cover up and hide existing scuffs and scratches and while protect your jeep from damage. Unique Design:The Bump Design Makes the Car more Three-dimensional while Breaking Monotonous Body Surface, Latest Upgrade Version and Custom Designed Make Your Jeep Looks Awesome.Increase The Sense of the Car’s Lines to Make It More Attractive Just with 1 Pair of JeCar Cowl Cover. Material:These Body Armor Cowl Guards Made of hight quality ABS Material and Completed in a Textured Black Finish for Aggressive Good Looks. ABS is an Extremely Strong Material Known for Its Light-weight, Superior Durability and Impact Resistance.Not Rust, Corrosion, Spin off or UV radiation. Perfect fitment:These Textured Black Cowl Armors are Designed for 2007-2017 Jeep Wrangler JK and JKU. Package included : A set of 2pcs of black Cowl Body Armor.